Does your equine friend need a horse massage? Have you noticed your horse a little stiff and reluctant each time you get on to ride and the warm-up time is quite an effort to get your horse working through the back and feeling more flexible and free? If you have answered yes then simple horse massage may provide relief. When you think about it the anatomy of the horse is very much like your own; muscles that create movement and a skeleton that offers support. Placing a saddle and bridle on and climbing aboard to compete in an event or just a casual ride muscles must be primed to perform. There is good news where you can provide a very easy to apply massage that can assist to help the muscles relax and reduce the tendency to have muscle stress post exercise. 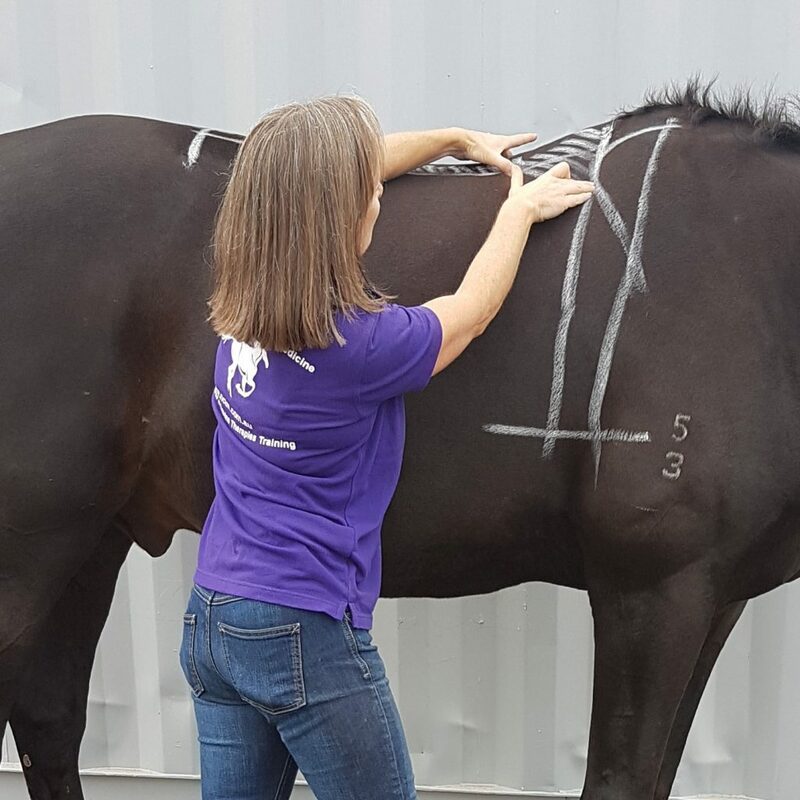 Keep reading and we will walk you through one simple process out of many we work through in our Equine Myofunctional Therapy course. When we are done you will know how to apply a simple but safe massage designed for pre and post activity. Ready? Let us commence. Open and close your hands to loosen them off and develop flexibility. About 10 times is enough. Do they feel nice and loose? If not continue until they do. Now move to the head of the horse and apply an open hand using a light long flowing stroke from the side of the face and all the way along the neck and down to the shoulder. Use just enough pressure where you can see the coat hair just lifting. Do this for about 6 strokes and as you feel the muscles loosening apply a little deeper pressure, always with your hands open and contoured to the area. Continuing to apply the same open handed technique to the entire shoulder area will be received very well by the horse as this is a part of the body that performs a lot of movement and activates very strong muscles. Now as you proceed over the back and abdomen you will feel a lot of bone and not a lot of muscle. The long flowing stroke is to aid relaxation and needs only a few strokes. The big machine that propels the body forward and actually is responsible for a huge amount of work is this area. You will feel big powerful muscles. The same long flowing stroke is to be applied and this time, start to press a little deeper in order to release these powerful muscles. Move to the other side and repeat exactly what you have done. Last but certainly not least, go over the entire horse again using long flowing strokes and feel for any heat or note sore spots by the way the horse responds to these areas and apply a little more basic massage only if the horse is accepting. This little routine should roughly take no more than 15mins each side. Of course there is a whole lot more to learn in regards to taking the step towards working as a Professional Horse Massage Practitioner. Our course material is designed so that each step of learning makes sense and help is at hand every step of the journey. Find out our next course dates here!